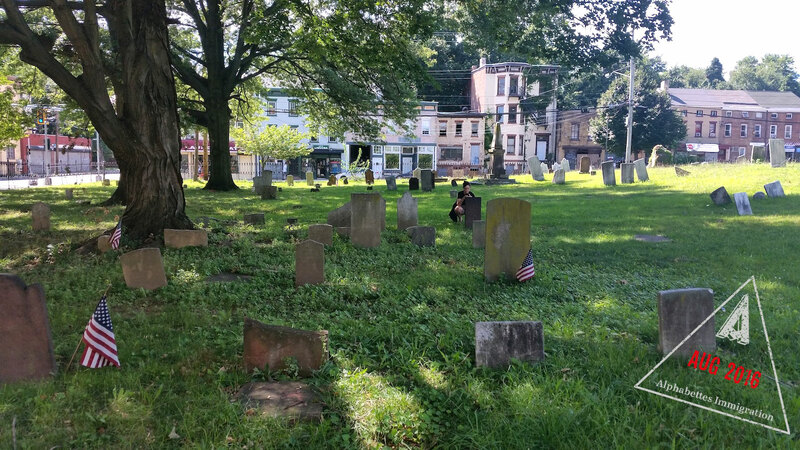 It’s no surprise that we type folk like hanging out in old cemeteries but it’s an extra treat when these cemeteries include the memorials of long-deceased type heroes. 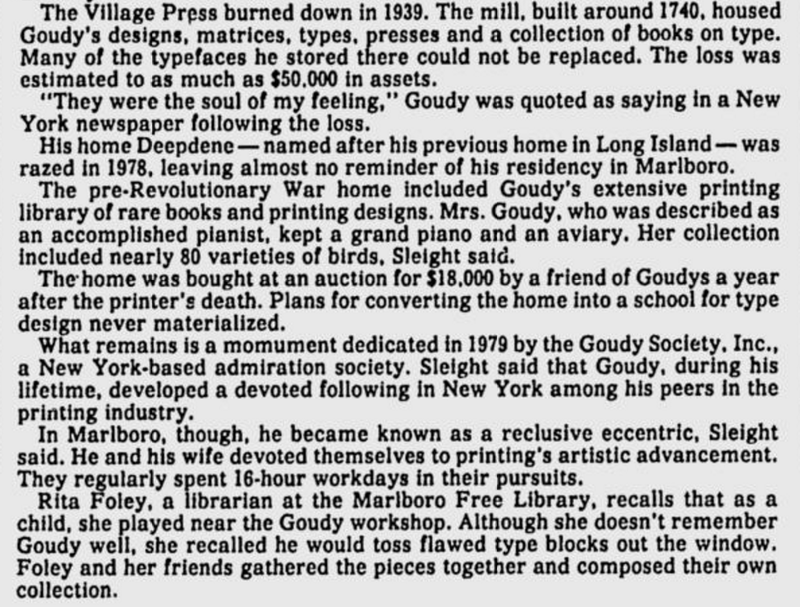 I’ve always known that Frederic and Bertha Goudy lived and worked in nearby Marlboro, New York. This excellent silent film on Type Culture shows Fred Goudy at Deepdene, their home and workshop. The Goudys’ workshop, an 18th century mill, burned down in 1939 (along with many of his type designs and fonts) and the home was torn down in the 70s, so there’s not much left to see on the Old Post Road property. However, I recently discovered this blog post from the Marlboro Free Library. Part of the library’s Goudy collection includes a photo of a memorial tablet in Newburgh, a small city on the Hudson river that has seen better times (but is trying hard to make a comeback). Although this probably requires some confirmation, according to this 1986 newspaper article, Fred and Bertha’s “mingled ashes” are buried beneath. Wow! Here’s a screenshot from the article, with some lovely details about Fred tossing type out the workshop window. When Indra said she’d be passing through the area for a few days, I knew we had to pay our respects. 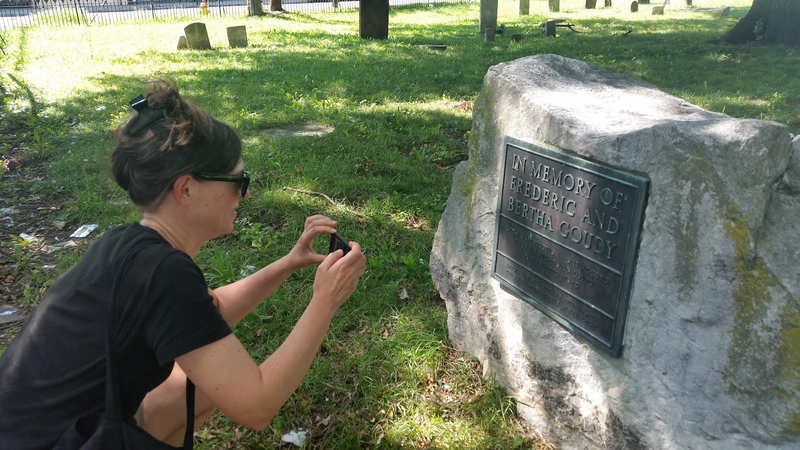 And that’s where we found ourselves on a hot and humid August day, after a visit to nearby Dia:Beacon: walking through the overgrown grass and carefully avoiding broken glass and garbage in the Old Town Cemetery on South Street to find the Goudy memorial tablet. This inscription is everything: With one devotion, one accord, they wrought and loved the printed word. Thanks for having us, Old Town Cemetery. This post is part of Greetings from, a series in which Alphabettes share typographic curiosities from around the world. Look out for a passport stamp in the photos to spot posts from the series, or read them all here. Amy is a design educator and type nerd living in New York’s Hudson Valley. She has written for The Recorder, Typographica, Type Network, and co-edited an issue of Visible Language. She helps keep the lights on here at Alphabettes.org.